Maldives political crisis escalates as President Abdulla Yameen defied Supreme Court's ruling to release opposition leaders. India said it is disturbed by the declaration of a state of emergency in the Maldives. Three judges of Maldives Supreme Court on Tuesday evening revoked its order to release nine high-profile political prisoners, one of the points in their 1 February verdict that was seen to have prompted President Abdulla Yameen to impose a state of emergency in Maldives and arrest two top judges. President Yameen, who had minutes earlier restored the powers of the judges to revisit the verdict, welcomed the tweaks. The compromise between the judiciary - the two top judges are still in jail - and government came around the same time that India said it was "disturbed" by the declaration of emergency and was "carefully" tracking the situation. Best known as an A-list holiday destination, Maldives plunged into crisis last week after a five judges of the Supreme Court quashed terrorism convictions against nine leading opposition figures, including the exiled Mr Nasheed, who was the country's first democratically elected president. As governments across the world expressed concern at the crisis in the Indian Ocean archipelago, President Yameen first came out with a 16-point explanation and later took to national television to justify the emergency for 15 days to probe "this plot, this coup" of a Supreme Court ruling. India's brief statement on Tuesday, the first since the imposition of emergency, spoke about President Yameen's government refusing to abide by the top court's verdict and suspending constitutional rights of the people. "The arrest of the Supreme Court Chief Justice and political figures are also reasons for concern," New Delhi added. Exiled former Maldives President Mohamed Nasheed, who is currently in Colombo, was expected to return and run for President after the 1 February verdict. Mr Nasheed, who was president from 2008 to 2013, was controversially convicted of terrorism in 2015 and sentenced to 13 years in jail. He was allowed to go to Britain for medical treatment in January 2016 and been in exile since. Mohamed Nasheed sought India's intervention to resolve the island's most serious political crisis in years. 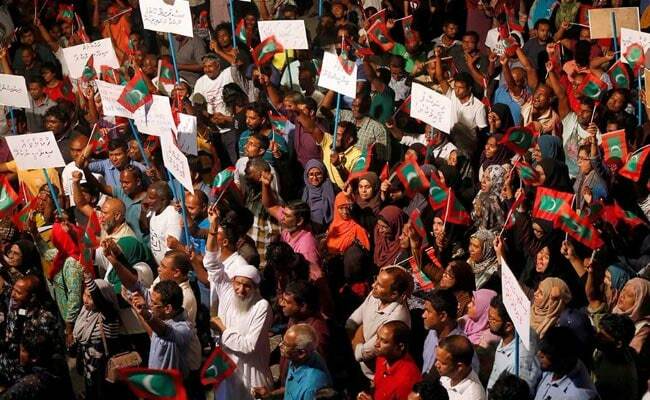 "On behalf of Maldivian people we humbly request: India to send envoy, backed by its military, to release judges & pol. detainees... We request a physical presence," he tweeted and has also the United States to block financial transactions of Mr Yameen's government. Mr Yameen, who came to power in 2013 after winning a controversial run-off against Mr Nasheed, has presided over an escalating crackdown on dissent, jailing almost all the political opposition. The Supreme Court ruling also nullified the sacking of 12 lawmakers for defecting from President Yameen's party, giving the opposition the majority in the assembly meaning they could potentially impeach the president. On Monday, when President Yameen sent soldiers to storm the court and arrest judges, the Maldives police also detained the president's estranged half-brother and former President Maumoon Abdul Gayoom, who had sided with the main opposition. Ahmed Shiyam Maldives military chief is publicly backing Mr Yameen. "The Maldives military will not stand by and watch Maldives go in to a crisis," he said on Sunday, warning he would not obey "unlawful orders" from the Supreme Court. But as ex-President Mr Gayoom, who ruled for 30 years until elections in 2008, was led out of his house, riot police saluted him, according to the local Maldives Independent website, and analysts have warned his arrest could split the security forces as he still commands deep respect. The emergency declaration gives sweeping powers to security forces and bars parliament from impeaching Mr Yameen. The opposition says it shows Mr Yameen is "desperate." Mr Yameen has drawn close to China and Saudi Arabia during his time in office, with both countries investing heavily in the tiny nation. Located near key shipping lanes, the Maldives have assumed greater importance to China after it began building political and economic ties as part of its so-called "String Of Pearls" strategy to build a network of ports in the Indian Ocean region. Having historically held more clout in the islands, India has sought to push back against China's growing influence there.